Here's a pic of Bruce (chilhuacle) slicing tomatoes (other colors than pink/red). back row, kristy (lunita at GW), Bruce, Bob, and Janice's guy, Dennis. 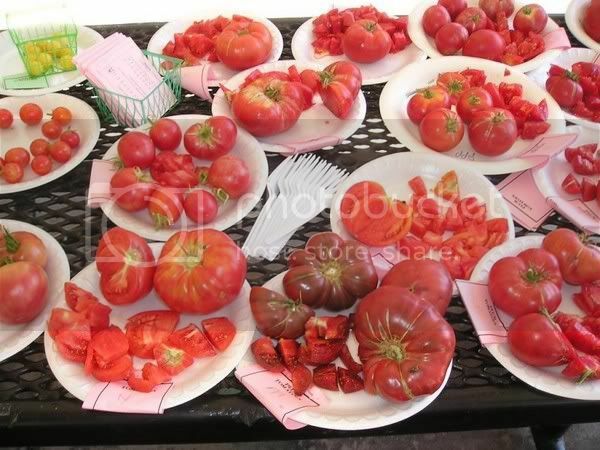 Lots of red and pink maters to slice! kristy, the gal who organized this event, was sick. She dropped things off and went home. 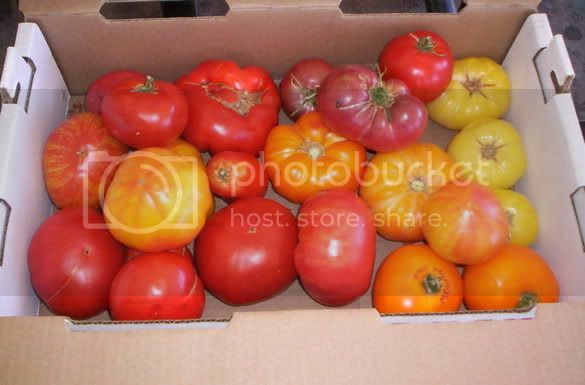 This is the box of tomatoes I left on her front doorstep. Looks like Dennis didn't like that last one! Poor, sick kristy getting ready to take a pic (BTW, she had just had a baby a few weeks b4 too!) And we were really surprised at how MANY different tomato varieties we ended up with. The purple tomatoes about 3 plates below the Snow White cherries on the left side of the table were Vorlon - very yummy. Another shot of the tomaotes. And not at NORCATT but the same weekend at the Morningsun tasting. Barb and her sister Pam. NOTE the salt shaker we smuggled in. Is that considered cheating? ?